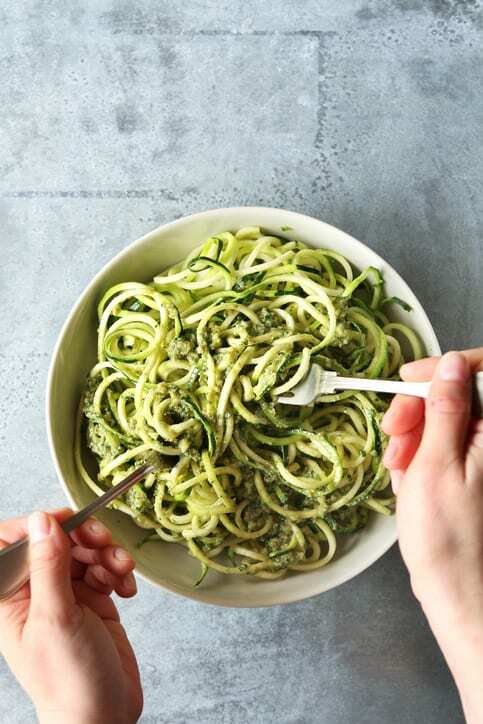 Try fresh zucchini noodles tossed in a creamy dairy-free avocado pesto for a delicious dinner this week. Dairy-free, gluten-free and vegan! Spiralize the zucchini to create "zoodles" and set aside on paper towels so any excess water is soaked up. In a food processor, add avocados, basil, garlic, pine nuts, lemon juice and salt until finely chopped. With the motor still running, add olive oil in a slow stream until emulsified and creamy. Drizzle olive oil in a large sillet over medium-high heat and add zoodles. Cook the zoodles for 1-2 minutes until tender. Add the zoodles to a large bowl and toss with the avocado pesto. Season with salt and pepper. Serve and enjoy!